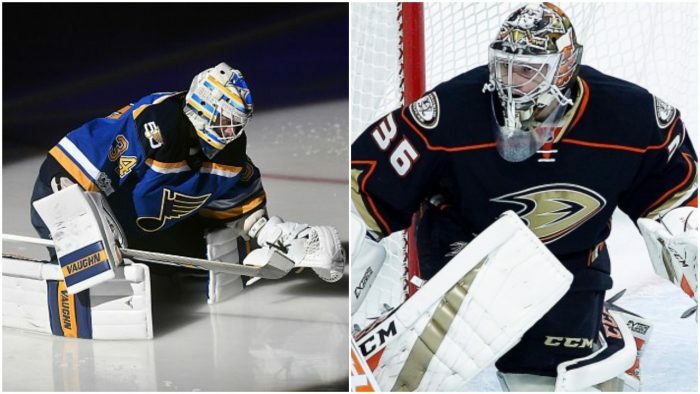 It’s that time of the year again: the NHL season is about to get underway, and that means it’s time for my predictions for 3 goalies to “boom” and 3 goalies to “bust” in the 2017-18 season. To look back at how accurate last year’s predictions were, click here. (Hint: not that accurate). This time around, I’ve added pictures of each goalie along with their stats from last year, as well as a couple of honorable mentions to wrap up the rankings. Enjoy! Raanta is an interesting goalie, and therefore, an interesting pick in my rankings. If you’ve read last year’s version, you’d know that I had him in the “bust” category. But, I did say that he would only be there for about a season– I’ve always liked him as a backup, and I think he’s one of the better “backup-turned-starters” the NHL has seen. Antti Raanta improved last season as the year went on, finishing strong with fantastic numbers on a bottom-feeding team. Expect the 2nd-year starter to stay on a roll behind a stronger, fuller Coyotes team up front. 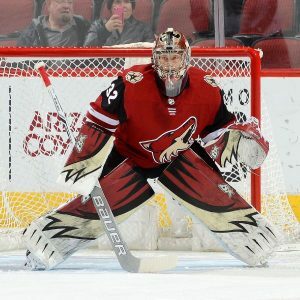 Look out for Raanta and the ‘Yotes to make some noise and try to claw their way into the playoff bubble this year. 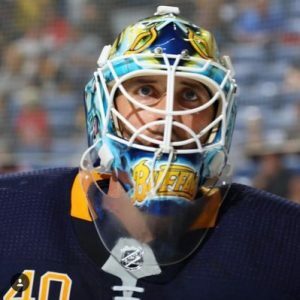 Carter Hutton is about to enter his first NHL season as the starting goalie of his team. Many times, this can go awry (I had Scott Darling “booming” in Carolina last year– look how that turned out), but, sometimes, it can go right. Hutton has shown promise as an interim starter in St. Louis, relieving Jake Allen of his duties for an extended amount of time on several occasions. He showed enough promise for Sabres General Manager Jason Botterill to take a chance and sign him, so his expectations are higher than usual, to say the least. Hutton has a couple factors in his favor: a new-look Sabres blue line, a (finally) exciting roster of young forwards, and an opportunity to take the reins and lead a team. Expect him to dazzle in his first year as a Buffalo Sabre. Jake Allen, the aforementioned St. Louis Blues goalie who gave Carter Hutton the opportunity to earn a starter’s contract, has been less than average in the past few seasons, to say the least. In each of the last three seasons, Allen has regressed in both major goalie statistics (Goals Against Average and Save Percentage), and just posted the worst numbers of his young career this past season. He lost his starting job to Hutton on several occasions, and was at the helm of the first Blues team to miss the playoffs in years. This is exactly why I expect Allen to “boom” this year; a goalie of Jake Allen’s caliber doesn’t stay cold for this long. 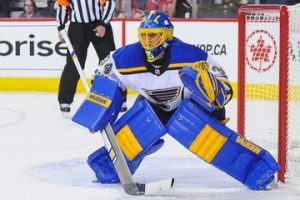 For a goalie who just a few years ago beat out Jaroslav Halak for the Blues crease, getting hot again shouldn’t be an issue. Besides, it’s in the blood of goalies to prove people wrong and bounce back from down years. This was a tough choice to make. 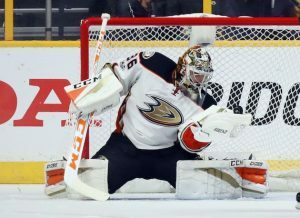 I’ve been a fan of John Gibson since he entered the league, and I want him to do well in Anaheim. His play style is unique and exciting, and I think he’ll have a good career in the NHL. However, the Anaheim Ducks have raised some questions as a team since the end of last season. The Ducks were swept in the first round of the playoffs by the San Jose Sharks, and Gibson struggled in that series. Many experts have Anaheim missing the playoffs this season, and it wouldn’t be surprising for Gibson to to take a step back himself. It seems like a common trend for the Philadelphia Flyers: trade for a goalie, misuse the goalie, rinse, repeat. Brian Elliott is just the latest in the rotating door of Flyers goalies, and is showing no signs of breaking the trend. This past season, Elliott wasn’t the solid starter Philly fans hoped for. Instead, he continued his personal struggles on the ice; Elliott has struggled since leaving the Blues a few seasons ago, and his age and injury history considered, shouldn’t be depended on to turn his game around any time soon. He finished this most recent playoff year with a 4.75 GAA and .856 SV%, so if that’s any indication of where his game is headed, buyers beware. Originally, I had Jacob Markstrom slated as the third, lone “bust” for the 2018-19 season. But, after looking at the Canucks roster, I thought that all three goaltenders should get the nod. After all, all three goaltenders will likely play 20+ games each this season, since no one of them is capable of maintaining the starting job. Jacob Markstrom is one of those goalies who, in his draft year, was projected to be an elite starter by now. A 2nd-rd pick by the Florida Panthers now a decade ago, Markstrom was supposed to develop into a franchise goalie. 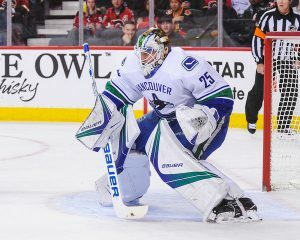 Now with a few seasons in Vancouver under his belt after being traded from the Cats for Roberto Luongo, he has all but proven himself to be a capable NHL goaltender. I’ve always liked him, so it’s hard for me to bash him like this. But, I don’t think he’s the answer the Canucks need in goal, and I can see him losing his starting job to a younger, more promising goalie in the near future. There isn’t much to say about Anders Nilsson, other than he is slated to backup Markstrom for the second year in a row. Nilsson has been a formidable backup in the past, most notably in New York with the Islanders, but has since failed to hold his own in an NHL crease. Granted, the Canucks haven’t iced a very impressive roster of players at all in recent years, but Nilsson is just as much to blame as any player on the team. I wouldn’t be surprised if he was replaced sooner rather than later. Thatcher Demko should be a name Vancouver Canucks fans get excited about. Demko was a 2nd-rd draft pick by the Canucks in 2014, and is expected to develop into a starting-caliber goalie in a matter of years. Demko might be the best thing, save a couple of forwards, that Vancouver has going for them right now, and he might be the only brights spot in this “bust” list of Canucks goalies. Look out for Demko to play his way into the Canucks crease sometime soon, and make a splash between the pipes.